After the recent release of my chocolate chip cookie recipe, a few of you requested that I make gluten free chocolate chip cookies. 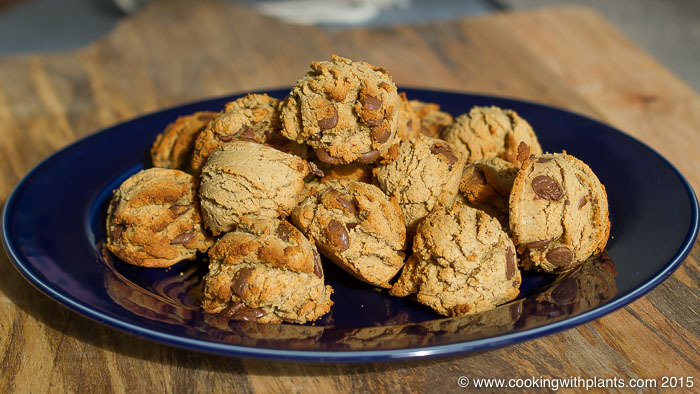 So here they are… Peanut Butter Chocolate Chip cookies – gluten free and delicious! I like to have these with an Almond Chai Latte and they are a perfect little treat for morning tea or an afternoon pick-me-up. For this recipe you will need a large mixing bowl and spoon, a lined baking tray and a small blender. First of all add your dry ingredients to your mixing bowl, then mix together. Now is a good time to get your oven on and set to 175 degrees C or 350 degrees F.
For the next stage add your wet ingredients to a blender and blend till smooth. Now add the blended mixture to the dry ingredients and mix thoroughly. Once mixed together use your hands to mix in the chocolate chips and combine the entire dough thoroughly. Use a medium sized ice-cream scoop or suitable spoon to evenly place scoops of cookie dough on your lined baking tray. Put your cookies in the oven for approximately 10-12 minutes or until golden brown. I’m a new plant based vegan. I just purchased all the ingredients to make your peanut butter chocolate chip cookies for my dad who has several food allergies, including corn. What can I substitute the corn starch with? Can I just leave it out? I love your channel! You’ve helped me to get more creative with my meals and spices. Thank you! They might end up more sticky. Hi. What can I use in place of the dates? Thanks for making videos with the recipes. It’s nice to be able to see exactly how everything is made. HI, i really love your recipes! Is there something i can substitute the dates with? theyre kinda expensive where im from!